Are you dealing with the loss of imaginary friends this season? I am. As you may or may not know or care, I once had 265,194 imaginary Facebook followers. I checked in on them on Friday, December 16, at 2:28 p.m. and all seemed well. Tragically, one day later, they were gone. Saturday morning, I woke up early and made coffee, confident that my tribe of imaginary followers had grown by the thousands during the night. I was even thinking of having a contest to let my readers guess when I would reach half a million. After checking the news on my computer, I reached for my phone for my Facebook follower fix. At first, I didn’t believe it. Not one FB follower! I kept refreshing the website, expecting them to be there for me. Not having a Facebook account had lulled me into thinking I would always be popular on Facebook. When they weren’t there, I wailed, “Why me?” When that brought no response from my husband, I wailed louder. He, however, is used to my wailing and didn’t even look up from his laptop. Crushed by the loss, I called out in my most anguished voice, “The whole world is against me!” At this point, my husband looked up from his apparently-more-interesting-than-me laptop and pointed out that most of the smaller countries are neutral, so my statement was not technically true. He may have meant well, but I was not going to let logic or reason cheat me out of my imaginary sorrow. Normally I do not eat chocolate early in the day nor do I recommend it. That is a slippery slope, friends, a dark chocolaty slope, almost bitter but still sweet, with extra chocolate drizzle on top. However, the magnitude of grief from losing that many imaginary followers drove me straight to the box of chocolate truffles that my husband bought for our anniversary. That plus another cup of coffee assuaged my pain, and I was able to move on. I did inform my husband that I might not be able to do any dishes on Saturday. Or cook. I still needed time (and chocolate) before I could look at my site stats again. Losing over a quarter of a million followers isn’t easy; however, when they are imaginary, it is easier than I imagined. I’m over them now. I know they’re out there, pretending to be friends with someone else. If you see them, say “hi,” and tell them I miss them. The loss of imaginary friends is nerve-wracking for many. The degree of anguish is often directly proportional to the degree of pretentiousness. I’m coming back for some laughs! I’m glad it made you smile. Fickle, thy name is IFBF [Imaginary FaceBook Friend] ! WAY sharper than a serpent’s tooth. On the bright side, though, you don’t have to come up with Christmas presents for them….so there. I never thought of the imaginary money I would save on Christmas gifts. Thank you. I think you should milk this tragedy at least a few more days. With chocolate and a longer sabbatical from dishwashing. You are apparently more interesting than his computer. Lucky woman. Now that I think of it, you are right. I bet you got your doctorate in chocolate. How did you get off the ceiling after chocolate AND coffee? That’s a combination that should keep you going into next week. I never worry about the ceiling; I need caffeine to get up off the floor in the morning. Don’t miss them, you’re better than them! Who needs pretend followers when you have REAL followers 😀 Maybe even a stalker or two which would really put the icing on the cake. That comment from your husband really tickled me, what a clever guy :D! You are so right, olletron. All each of us wants is to have people who read the things we write. 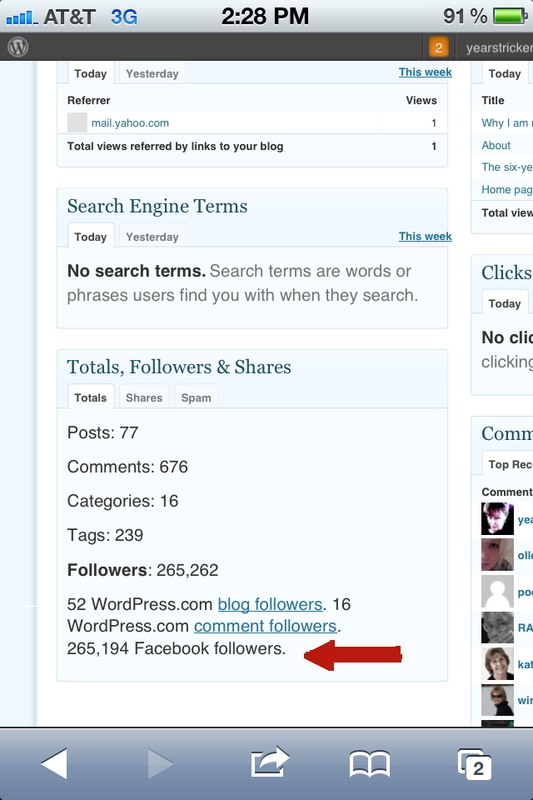 I am happy (and surprised) to know that some people read my blog. I imagine that most bloggers feel that way. Yes, the roach post is creepy. Even I think so. I love that quote from Oscar Wilde about losing parents. It was clever of you to think of that. If I had, I’m sure I would have used it in the post.